Everything you wanted to know about the recruiting process. Last month, we asked readers what they wanted to hear about from recruiters. The response was huge. The same few questions kept popping up again and again, so we decided to feature them in a two-part blog series. 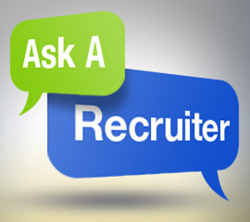 We took your questions to our top recruiters, and they replied with expert responses. If an employee asks for a staffing company to help them find a new job, do they tell your current job that you are looking for work elsewhere or keep that information confidential? All our recruiters agree that keeping the job search confidential is key. They never notify your current employer that you’ve started the job search, and they recommend that you keep quiet on the topic as well. “It would depend on the situation. I have found that when a layoff is imminent, managers know and understand that their cohorts will be looking and interviewing at other companies. If this is not the case and business is ‘good,’ I would advise against letting your manager know that you are looking for work.” —Desiree Stevens, Littleton, CO.
“In my experience, many applicants ask that we do not contact their current employer in fear of losing their job. Last week, a coworker of mine was working with an associate who was looking to leave their current employer. The employer overheard a conversation that took place at work and fired them for it.”—John Calabrese Jr., Utica, NY. Why do companies require a college degree when it isn’t necessary for the job? Many companies use a college degree as a baseline. Sometimes a degree is indicative of passion and hard work. However, that doesn’t mean that you might not be able to make up for the lack of a degree in other ways. “Sometimes this is a company policy. I tell people to never let it deter you in applying. Many clients will take on-the-job experience in lieu of a degree.”—Shannon Jacoby, Bellingham, WA. “Some positions may require a degree for specialized positions, for example, a mechanical engineer. For other positions, completing a degree signals to an employer that you are a person who is determined to see a task through and committed to doing so.”—Desiree Stevens, Littleton, CO.
Why do some companies/staffing companies continue to post jobs that have already been filled ? This one’s a bit complicated. When it’s a posting from a staffing company, it could be that the same position is being offered at multiple companies. In addition, some job listings are purchased for a certain amount of time and will stay online regardless of being filled or not. “A lot of the time, for a staffing company, there is more than one job available or the same job is available with a different company. Also, when a job is posted, it usually has an ad run time of 30+ days to attract the most job seekers. Even if they find an applicant before that time, the ad will continue to run.”—Heather Buster, Texarkana, Arkansas. “Our office often leaves jobs up on the job boards just in case the candidate who was chosen doesn’t work out. It is good to have extra candidates in our back pocket if we need them. We also use the same strategy for jobs that we may not have now but know we will get soon, so we can cut down on the time it takes to fill the position.”— John Calabrese Jr., Utica, NY. Have any more questions for our recruiters? Let us know in the comments below! Previous Post Is Your Online Activity Costing You the Job? I felt all information supplied about the recruiting process was very helpful. Communicating information is a benefit to all. Great job. Thanks for the comment Diana!